I need a vacation. Seven inches of snow fell this weekend, and I know a tropical vacation will lift my spirits immensely. Time off works wonders for the mind and spirit, but in all things business, even time off must be managed with the needs of others balancing with the demands of the company. Managing vacation, trainings, meetings, leaves, sick days, PTO, and other often unanticipated absences can sometimes be challenging. And sometimes absenteeism can be abusive. Imagine the challenge faced when over 200 Chicago correction officers called in sick during the airing of the Superbowl, again on Father’s Day, and then all came down with the flu on game seven of the NBA finals. Mass absenteeism resulted in a lock down of the Chicago jails. While your company may not experience mass absenteeism, most companies do lose productivity when workers take time off for extended periods of time. For companies employing 50 of more workers, absentee management involves tracking of FMLA time. FMLA management and absence tracking can be simplified with the right workforce management (WFM) software. Monitor absenteeism and discourage time off abuses. The right tools make a difference. 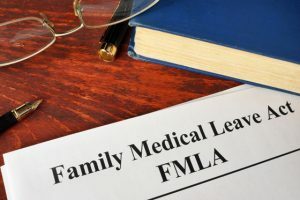 The Family Medical Leave Act (FMLA) was enacted to allow workers to remain employed during long periods of illness or bonding with new infants. The federal law only covers workers at companies with 50 or more employees. Employees must have worked for the company for one year with 1,250 hours in the past year to qualify for the benefit, and the 12 weeks of unpaid leave may be taken once a year after qualifying. The federal law expanded the leave time to 26 weeks when dealing with military members. In addition to the federal law, several states have policies that have dropped the 50-employee threshold, expanded the coverage, and revised definitions of those who qualify and under what conditions. Unions also provide an additional layer of regulations concerning time off that must balance with state and federal law. Blocks of absences are somewhat easier to manage than intermittent time off. Intermittent FMLA implies the twelve weeks of unpaid days off are doled out a day or two at a time – and many employers think this time is abused. Thus, it is imperative that your HR and accounting staff is on top of the federal and state policies – also look to your workforce management (WFM) software suite. If it has up-to-date scheduling, absence tracking and FMLA management capabilities, the tasks required to record and monitor FMLA use (and/or abuse), vacations, sick days and other paid time off (PTO), etc. are greatly simplified. One of the best ways to deter workers from abusing time off is for them to be aware that you are tracking and documenting that time. All absences, including vacations and vacation requests should be documented and the scheduling and absence management tools in your WFM suite can serve as one method of documentation. Your WFM software will not be able to determine eligibility for FMLA, but it can help to track that time. In addition to keeping track of how many hours the worker has taken as time off and how much time the worker has left to use, the scheduler should also retain vacation and time off requests – including those requests that are denied. With this data, it can then be determined if a pattern emerges where workers claim FMLA days when they’ve previously been denied PTO. In short, a WFM suite with absence management functionality is built for tracking all types of absences, from vacation to sick days and PTO to FMLA, and it should be the tool regularly used to perform these tasks. The scheduler can count this time off incrementally – eight one-hour absences still equals an eight-hour day absence. You have enough to worry about with FMLA – use your scheduling tool wisely as a source to uncover abuse should it occur. Make sure your workers know you are tracking and stop the abuse before it happens. Everyone needs time off and those that abuse FMLA make it harder on those who truly need it. And, on a side note, if your WFM suite includes tools for workers to do self-scheduling, vacation planning, shift bidding, overtime planning, work confirmation, etc., there are also other benefits. First, you empower your workers to take more control of their work lives by involving them more directly in your scheduling process. This can contribute to lower absenteeism and lower turnover rates by boosting morale and increasing engagement within your teams. It can also improve the efficiency of your operations, reduce administrative costs and reduce supervisory and/or administrative time spend on scheduling and work confirmation for payroll. A privately-held, American-owned company, Pipkins, Inc. was founded in 1983. Headquartered in St. Louis, Missouri, the firm is a leading supplier of workforce management software, providing sophisticated, cloud-based forecasting and scheduling technology, as well as other fully integrated solutions for performance management, real-time adherence, time and attendance tracking, task tracking, absence tracking, FMLA management, compliance monitoring, mentoring, collaboration, and more.